Life Designer®, author, speaker and podcast host, Julie Reisler, MA, ACC is the founder & CEO of Empowered Living, LLC | www.juliereisler.com |a coaching and personal development training company. Julie's book, Get a PhD in YOU, is all about learning to master your inner world so you can master your outer world. Get your free bonus chapter at www.juliereisler.com. While she got her Master's in coaching, it could have been in crappy self-esteem, not feeling 'good enough' and emotional overeating. Julie is all about your getting past negative and limited beliefs so that you can soar in your life. Julie coaches many women and men from diverse backgrounds in any area that matters to them, such as overall wellness, self-confidence, emotional overeating, relationships and work/life balance. Julie serves as a faculty member at Georgetown University and Maryland University of Integrative Health in their coaching programs. Julie is a certified Meyers-Briggs practitioner and Mindful Eating facilitator. She has designed numerous programs incorporating mindset, nourishment and mindfulness to help others improve life satisfacation, relationship to self, productivity and creativity. Julie has appeared in Health magazine, MORE magazine and the New York Times. 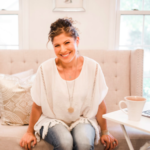 Julie has her Master’s Degree in Health & Wellness Coaching and concentration in Nutrition from Maryland University of Integrative Health, Bachelor's in Psychology and Public Health from the University of Rochester and a Graduate Certificate in Organization Development from Georgetown University.